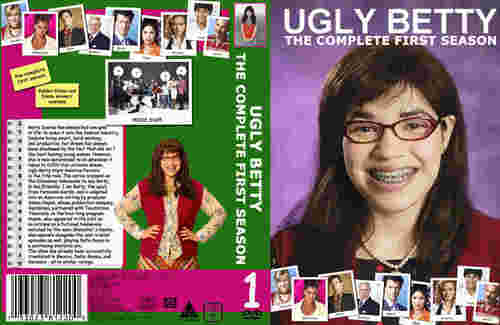 ugly betty season 1 dvd- region 2 custom. . HD Wallpaper and background images in the Ugly Betty club tagged: ugly betty season 1. This Ugly Betty photo contains anime, comic book, manga, and cartoon. There might also be newspaper, paper, magazine, tabloid, rag, portrait, headshot, and closeup. I have never seen this one is it the American one ?? Thanks for Posting. well, it is supposed to be region 1, although as it is a custom made cover, i'm presuming the design was created by the person who originally submitted it and is therefore not the actual cover. and as ever, no probs.